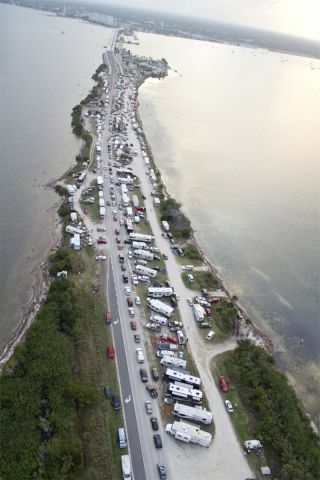 The A. Max Brewer Causeway in Titusville, Fla., was packed with onlookers for the last launch of the space shuttle Discovery in February 2011. The Florida space coast is expecting near-record crowds to flock to Cape Canaveral to watch the space shuttle Endeavour launch on its last voyage April 29. The area around NASA's seaside Kennedy Space Center in Cape Canaveral, where the shuttles are launched, saw between 400,000 and 500,000 visitors for the last liftoff of the shuttle Discovery in February, according to Robert Varley, executive director of Florida's Space Coast Office of Tourism. "We think we're going to do better than that this time," Varley told SPACE.com. "It's going to be a big day next week." He predicted at least half a million visitors, and likely more, for Friday's blastoff at 3:47 p.m. EDT (1947 GMT). In comparison, most regular shuttle launches draw between 150,000 and 200,000 visitors, Varley said. Where those usually bring about $4 million to $5 million in to the area, Endeavour's launch is expected to cause between a $10 million to $15 million economic impact, he said. The area has about 11,000 hotel rooms, between 4,000 and 5,000 condominiums and another 35,000 campsites, he estimated. Nearly all of those are booked for this week. Oral Ali, general manager of the Clarion Hotel in Merritt Island, the Luna Sea Bed and Breakfast Motel in Cocoa Beach and the Travelodge in Cocoa, said he is seeing much more interest in the upcoming launch compared to normal launches. His 270 rooms have been booked for at least a month. "It's very hard to say no to people," he said. "I wish I had another hotel the same size." The Space Coast Office of Tourism tracks rooms and can be a good resource in trying to track down places that may have vacancies. "Most people are now aware that it's the last of the shuttle launches and so they're trying to come see one," said Sheryl Rodriguez, an employee at the Cape Winds Resort in Cape Canaveral, which is fully booked for next week. "It's very difficult -- just about everybody is sold out." The fact that next Friday's launch will be the last ever for Endeavour has certainly led to some of the boost in attendance. The liftoff is also especially high profile because President Barack Obama has announced that he will bring his family to watch in person. Endeavour is slated to carry six astronauts, a load of spare supplies and an ambitious $2 billion particle detector to the International Space Station. During a two-week visit, the shuttle astronauts will conduct four spacewalks to outfit and upgrade the station. It's not just the Cape Canaveral area that's getting a boost. People planning to attend the launch are also staying in tourist destinations such as Orlando (about an hour away) and Daytona (about 1 1/2 hours away), Varley said. The visitors' center at Kennedy Space Center, which houses a museum with rockets on display, an IMAX theater, rides and more, has also seen a huge boost in traffic in recent weeks, partly due to the fact that Endeavour can now be seen standing at the ready on Launch Pad 39A. "They're experiencing extreme high numbers of visitation -- around 10,000 or 11,000 people a day out there," Varley said. Overall, next week's space shot is expected to rival some of the most famous in history, in terms of turnout. The Apollo 11 launch in July 1969, which sent astronauts Neil Armstrong, Buzz Aldrin and Michael Collins to the moon for the first time, drew close to a million people to Florida's Space Coast, Varley said. He predicted Endeavour's blastoff next week will attract crowds close to that level. And the effect is only likely to balloon for the next launch -- the June 28 liftoff of shuttle Atlantis. That is that last planned space shuttle mission ever, before all three orbiters are retired to museums. "The last one will definitely draw over a million people," Varley said. "I have no doubt. It's history."